USA based online Tech review site CNET have released a video for their CNET TV show Always On with Molly Wood which looks at different electric bikes and how they can benefit your lifestyle. 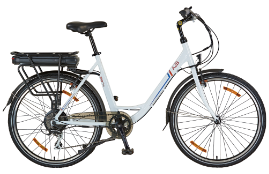 Hero Eco are mentioned as one of the global eBike manufacturers, however none of the A2B range are reviewed, yet. While Molly tests out electric bikes in San Francisco on some of the most intimidating hills available, we are confidant that anyone testing out an A2B will be just as impressed. We look forward to helping nurture the USA market as it grows through participation in activities like the Ride the Future Tour which starts it's trek across the USA tomorrow. Check out the video from CNET TV below or on their site.